WinADay Casino has just launched yet another easy-to-play penny slot. 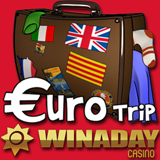 The new Euro Trip, available only at WinADay, is a vacation-themed game with both Wild and Double Wild Symbols. There's a 50% deposit bonus this week and everyone that logs on August 14 – 17 will find an $8 free chip in their account. Euro Trip is an 11 payline instant play casino game with snorkels, cameras, suitcases, planes, yachts and tourist attractions like the Eiffel Tower and the Leaning Tower of Pisa spinning on its reels. Players can select coin values of $0.005, $0.010, $0.020 or $0.050 and 5 different bet levels, wagering as little as half a penny or up to $2.75 per spin. Its Double Wild symbol substitutes for any other symbol and doubles any win that it is part of. WinADay now has 28 premium slots, 16 penny slots and 10 video poker games as well as Roulette and Keno. The penny slots are also provided in specially enhanced versions for iPhones, iPads and Android phones and tablets.